The common man is unable to interface with Ultimate Truth because he sees, experiences, lives within an incomplete, inaccurate, partial pseudo-reality created by the mind. The lens of the mind is too narrow, too myopic, too one dimensional ~ only the physical world is perceived. One cannot live through the mind and see the ultimate multidimensional reality ~ experience full-spectrum universal spiritual truth ~ be in transcendent states of universal-cosmic-consciousness ~ or be transformed into a fully conscious, spiritually enlightened being. We use specific methods, meditations, and spiritual technologies that will help you to release your ego-mind, change your primary source of life-energy, and realize your inner universal spiritual self. This will help you experience your innate oneness, divine-unity and interconnectedness with Everything. The Spiritual Awareness Project provides seekers of existential truth with training, counseling, and instruction in the proper use of spiritual technologies designed to potentiate the explorers of alternative hyperspace dimensions with the capacity to have spiritual experiences beyond the mind ~ to enter into luminous hyperdimensional realities ~ teleport directly into the interdimensional / extraterrestrial / UFO phenomenon and interact with the supernatural denizens of an exotic non-physical subspace reality. Existential truth cannot be captured, written down on paper, analyzed, examined, or dissected by the mind of man. Existential universal truth is far too big for the mind to grasp. The enormity and immensity of full spectrum truth / reality is staggering and humbling. The human mind is merely a side-show ~ an insignificant bunny trail off the interdimensional super-conscious highway. Huge areas of existential truth are simply imperceptible to the mind, given that the mind itself is only a narrow corner within the infinite bandwidth of universal consciousness ~ limited in scope, vision, and perception to phenomena existing only at one extreme polarity of the existential spectrum ~ our familiar three-dimensional, atomic/molecular, space/time continuum, if you will. The whole truth must be entered into with one's whole being, not just the mind. In fact, mind is most certainly the main obstacle, the main barrier that stands in the way of knowing truth directly. We are used to the idea of some things in life being too complicated to understand, but spiritual enlightenment, interdimensional spiritual planes of existence, hyperspace realities are too simple. They embody the strange mysterious quality of being so immensely simple that it is beyond what the human mind is able to grasp or comprehend. It is simple yet immense, vast, boundless, as infinite as existence itself. The human mind does not have the depth, the capacity, or the ability to comprehend it, fathom it - to take it all in... to communicate with it, merge with it, or have intimate spiritual communion with it. Which is why one must go out of one's mind, transcend one's mind, to clearly understand it. Only when the mind is expanded, unfolded into universal consciousness can the phenomena be fully grasped, because one's entire perspective is re-calibrated. Reality and truth are beyond the mind, and if you want to enter into them, experience them directly, then you must go out of your mind ~ transcend the ego-mind state through our mind-expanding meditations and mantras, psychotropic preparations, prayer, ancient and modern scripture. It is a process, an event, a transformation that you go through with your entire being... far more than just dry intellectual book-learning. Through a variety of methods we relax the mind, unfold the mind into its natural primordial expanded state of universal spiritual awareness. 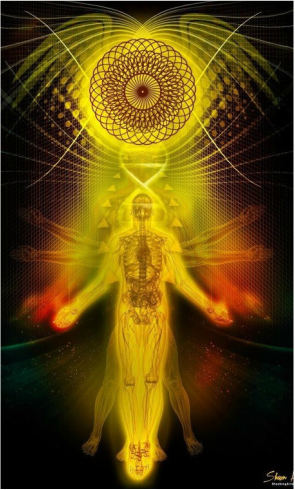 Through entheogenic spiritual technologies we come to a mystical, transformational, revolutionary inflection point ~ an illuminative epiphanic awakening event from which there is no return... It is the tenth month of a pregnancy ~ spiritual rebirth and awakenment is an ineludible inevitability. Seeing, experiencing, exploring universal hyperspatial truth is possible only if one manages to find the key that opens the door to the universal mind. One must, through sutras, meditation and special realizations, transcend, teleport beyond the small ego-mind self into full-spectrum truth, hyperspace reality ~ a reality that includes, contains, encompasses all realms, planes, dimensions that exist ~ the full bandwidth of existence. Only then can one grasp the entire significance of the interdimensional hyperspace phenomenon ~ approach, encounter, experience, and interface with the phenomenon ~ enter into psychospiritual telegnostic communion, interconnectedness, and oneness with hyperdimensional superconscious energy field phenomena and the transcendental supernatural beings who inhabit these realms. ​The cognitive dissonance peculiar to the cerebral endeavors of the ego-mind have always been the inexorable barrier prohibiting us from experiencing the higher harmonics, luminous dimensions, and living fields of superconscious interconnectivity we would know... if only we could gather the courage to go out of our minds. The Truth cannot be captured through any faculty of the mind or abstract intellectual process. The perceptible existential spectrum, revealed through mental agencies and the unawakened carnal eye, comes to us only partially, in a severely diminished and disguised form, with acutely circumscribed limits and parameters... a misrepresentation of a three-dimensional, pseudo-reality landscape, perpetually projected onto the screen of consciousness through misperceived, insufficiently developed, intellectual processes ~ contours of thought heavily influenced by western societies modern systems of perceptual programming, emotional / behavioral manipulation, and hyperconsumeristic conditioning. This narrow bandwidth of the existential spectrum does not encompass the higher harmonics of the hyperdimensional subspace matrix ~ the very hyperspace realities we are interested in exploring... consequently, all who fail to develop the essential mystical hyperintuition, clairsentience, and insight ~ all who fail to expand and illuminate their intelligence ~ their esoteric knowledge ~ have no actual awareness, familiarity, or direct interactive experience with 90% of the existential spectrum, but are only distantly acquainted with second-hand rumors, mythologies, theories, and speculations about the spiritual life ~ about God. The shallow repository of existential knowledge that is accessible, apprehensible, and understandable through ordinary intellectual processes, is not an adequate foundation for a true spiritual life. Only when ego-mind dissolves into the integrative oceanic spiritual experience ~ unfolds into it's higher universal spiritual Self ~ evolves into expanded ethereal fields of superconscious interconnectivity... only as ancient ultra-advanced hyperspace beings reveal themselves to us ~ supernaturally intercommune and interconnect with us in states of divine-unification ~ in states of extraordinary spiritual hyperconsciousness... only when celestial beings of living light invite us to disappear with them into the Pure Void ~ transporting us into the transcendental hyperintuitive visionary life ~ into the Supreme Reality ~ does one finally have the "aha!" moment when all the missing pieces of the existential puzzle snap into place. As we awaken to profound mysteries of alternative hyperphysical realities within the infinite cosmic depths of our being ~ to ancient esoteric knowledge stored within the transcendental extraterrestrial akashic field ~ to intercommunion with God and the primordial oceanic matrix of love-consciousness... we realize they are ALL knowable, perceivable, experienceable ~ within reach... but through altered dialated perception, meditation, mind-expanding entheological spiritual technologies, and higher states of consciousness... rather than by logical, abstract, intellectual processes. As one contemplates a life of spiritually transformative interrelationships, profound revelatory experiences, and entheological influences: mysticism, transcendentalism, esotericism ~ illuminative psychedelic plants and chemicals ~ supernatural fields, forces, and hyperdynamics ~ extraterrestrial landscapes and beings; a life filled with all of the mystical hyperphysical wonders, miracles, and cosmic-energies a seeker encounters while navigating the deep ontological waters of his epic mystical voyage through ethereal hyperdimensional realms ~ exotic alien milieus ~ the supraliminal primordial hyper-realities of the Beyond... one realizes the temporal superficialities of the physical plane have been greatly exaggerated by those who have become irretrievably entangled in the world of the "other" ~ by those who believe nothing could possibly exist beyond the high-density, three-dimensional, pseudo-reality paradigm that securely encapsulates them. The transcendental mystical journey awakens us into a supernatural paraphysical life of ecstatic universal spiritual hyperawareness. It is a life of divine mystical oneness, harmony, and interconnectivity with God, Ultimate Reality, and the higher spiritual Self ~ of deeply symbolic hyperintuitive imagery, profound mystical visions, and the entheological Aquarian consciousness paradigm. It is a life of teleportation into ultra-advanced luminous hyperspace domains ~ full immersion into the interdimensional / UFO phenomena... we are catapulted into a life of higher existential truths, insights, and realizations that transcend ordinary understanding ~ a life of hyperdimensional, supernatural, spiritual experiences beyond intellectual comprehension.